Bharati Tamang, the wife of slain ABGL leader Madan Tamang today ended her indefinite fast hours after Calcutta High Court adjourned the case of anticipatory bail for 23 Gorkha Janmukti Morcha top leaders and activists. The ending of the fast was marred by confusion since afternoon. After the 69-year-old ABGL chief, who is demanding the arrest of the alleged killers of her husband, ended her protest at 3.10pm, she was put on a vehicle to be taken to hospital, but returned to the Chowrasta protest spot to resume her strike 10 minutes later after supporters requested she should wait to hear the high court order. Around 3pm, M. Mondal, a doctor of Darjeeling hospital, did a check-up on Bharati and advised that she should be admitted to the hospital as continuing to fast could affect her kidneys. Bharati, a hypertension patient, had refused to take medicines since Sunday. Since no one heeded the doctor's advice, Mondal left the spot and stood nearby. Soon, Bharati complained of dizziness and the doctor once again came to check on her and advised her to be hospitalised. Some supporters lifted her on her feet but Bharati refused to go to the hospital. 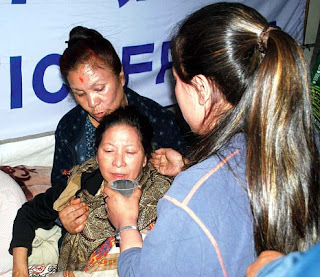 Pratap Khati, an ABGL leader, then advised her to go to the hospital, fearing her health may deteriorate. Bharati started walking towards an ambulance that was parked at the spot but when she could not walk, she was carried to the ambulance. As the ambulance started to move towards the Darjeeling district hospital, supporters of ABGL and other constituents of the Democratic Front, which is unitedly asking for the arrests, started shouting and discussing that they wait for at least two hours for the high court order. The supporters accompanying Bharati were contacted over phone and the ambulance, which had reached the Gorkha Rangamanch Bhavan that is about 500m from the spot, was asked to return. Bharati was again brought back to the hunger strike venue. Around 3.40pm, when the ABGL and the other front constituents came to know about the adjournment, they went into a huddle. After the meeting, Shankar Hang Subba, spokesman for the front, said: "We have decided to lift the hunger strike to respect the court's directive. The directive is a victory for us as the court has not yet granted them bail. We will sit for a meeting the day after tomorrow to chart our future course of action." Khati later said: "Every option is open to us. We can even go to court against to appeal against today's directive. However, nothing has been finalised." Bharati finally ended her fast after grand-daughter Aniela offered her a glass of water. She was then taken by her supporters to the Planter's hospital. Bharati Tamang, the wife of slain ABGL leader Madan Tamang today ended her indefinite fast hours after Calcutta High Court adjourned the case of anticipatory bail for 23 Gorkha Janmukti Morcha top leaders and activists. The ending of the fast was marred by confusion since afternoon.